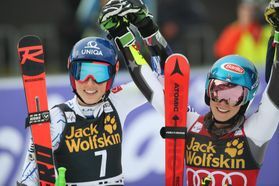 Petra Vlhova and Mikaela Shiffrin are tied and will share the victory for 55.Golden Fox! Meta Hrovat took 8.place and Ilka Štuhec 12. Petra Vlhova attacked hard in GS final run and loud cheering from Slovakian fans took her to the top. Mikaela Shiffrin had 0.5s of advantage but finished tied with Petra Vlhova. For the first time we have 2 winners of GS! Ragnhild Mowinckel from Norway placed third. Slovenians also did well. Ilka Štuhec took the leading position for a while and later had to rush to airport to catch the plane for Sweden. Meta Hrovat finished the race on 8. place. 5.000 cheering fans created a great athmosphere and this day can end with many positive feedback from racers about the race course and organization.